Use this homemade skin lightening recipe every day before you go to bed, and you’ll notice a change in your skin complexion with this best skin whitening home remedy! In a bowl, add 1-2 tbsp rice flour. Rice flour is used as a major beauty ingredient since centuries. It is known to be a great anti-inflammatory and skin whitening agent. Add a pinch of turmeric to the bowl. Turmeric helps to reduce scars and acne. The inflammatory property of turmeric soothes your skin pores. Add 2-3 tbsp of cucumber juice to the bowl. Again, cucumber is also an anti-inflammatory agent that cures sunburns and balances water level thereby reducing dryness. Mix the ingredients well until you get a paste of the same consistency as above. You can add more cucumber juice to get to the right consistency. Rub this skin whitening scrub on your face for 5 minutes then wash off with plain water. Take another bowl and add 2 tbsp of sandalwood powder. Regular use of sandalwood powder is known to reduce wrinkles, aging, soothe sunburn and remove suntan. Add 2 tbsp of rose water. It is a great ingredient, that fights against acne, soothes irritated skin and even helps in diseases like eczema. Add 1 tbsp of honey to the bowl. Honey helps in reducing and preventing acne. Mix the ingredients well to get a paste of the consistency as above. Again, you can increase the amount of rosewater. 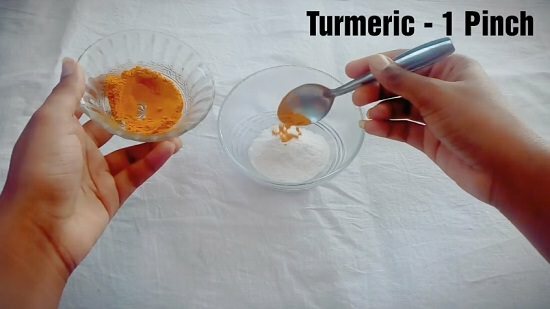 Your homemade skin lightening recipe is ready. Apply it for 15 minutes then wash your face with cold water.